Jewelry is an imaginative and inexpensive way to add color and interest to your wardrobe or wall, which also seems to be one of the reasons why women collect so many pieces in a variety of different styles. However, keeping that jewelry organized so that you can find the right necklace, bracelet or pair of earrings when you want them can be a problem. 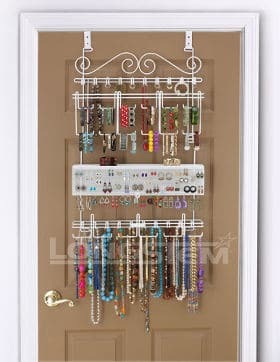 A wall mount necklace and jewelry organizer is a great way to organize all your jewelry and keep it plainly in sight. So, here is a look at some of the more popular wall mounted necklace and jewelry hangers on the market. The Rbenxia Wall Mount Jewelry Organizer is an elegant looking holder designed for all your jewelry. Organizes earrings, necklaces and bracelets. Holds 14 pair of earrings. 10 hooks for holding necklaces and bracelets. This holder can organize and display a fair amount of jewelry. It has three levels. 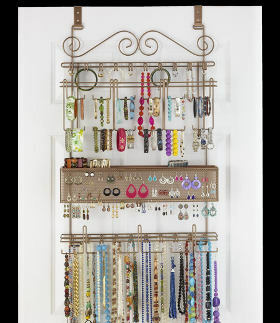 While the hooks at the bottom are perfect for holding long necklaces, the top two levels are removable bars. One level is perfect for earrings and holds up to 14 pairs, and the other bar holds rings and bracelets. The heart shaped design is elegant and adds a bit of interest. We like this organizer’s stylish design and find that it will look nice hanging on the bedroom wall. There is a small loop at the top to attach it to the wall. However, it will be more stable if you place additional nails or screws over the two top curly cues. Reviews for this heart themed jewelry organizer are very good. Some users have said that it is sturdy enough but they felt it could be a bit taller from top to the bottom. Looks great on the wall. Perfect for holding long necklaces in an organized manner. Rings fit on the bracelet bar allowing you to keep all jewelry together. 38 hooks to hold all your jewelry safely and keep it organized. Constructed of heavy duty white bake on powder coated carbon steel. Tray for holding bulky jewelry and rings. This is a large jewelry holder that can be hung over your closet or bedroom door, or can be directly mounted onto the wall. It holds a ton of jewelry including earrings, bracelets, necklaces and watches. It also has a handy tray for rings and bangle bracelets. This hanger allows you to see every piece of your jewelry and easily select the proper pieces you want to wear. All jewelry can easily be seen. Good weight and very sturdy. Comes with hardware to hang on the wall or over the door. 38 hooks, holds 300 pieces of jewelry. Suitable for earrings, bracelets, necklaces, watches, pins and more. Heavy duty bronze on power coated carbon steel. It comes with all the necessary hardware to hang it over a door or mount it to the wall, giving you some versatility in options. The hooks fit a standard size door and a tray, which is perfect for holding rings or bangle bracelets, is included. This looks like a great organizer for people who have a lot of jewelry and want to organize it in a manner that is easy for them to see and choose from. So, this product is large enough to meet most people’s needs. Looks great hanging on the door or wall. You can easily see everything. Made of polycarbonate acrylic in a variety of different colors. Holds up to 34 pair of earrings. Can be mounted on a door, wardrobe, cabinet, wall or even mirror. 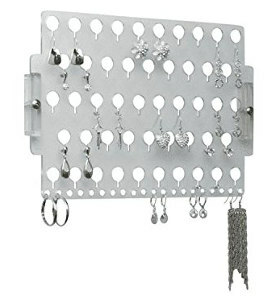 This handy closet earring holder is good for those people who have many pairs of earrings they want to keep organized. The variety of colors available allows it to fit into any type of décor and makes your earring collection easy to see. For those women who wear earrings and not other jewelry on a regular basis, this product is an easy and nice looking way to keep their earrings all together in one place where they are easy to get to. Nice quality durable plastic holder. 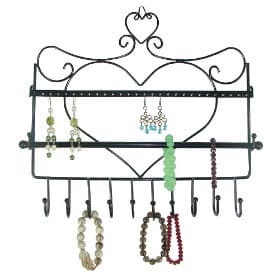 Wall mount jewelry organizer shelf holds up to 49 pairs of earrings. 9 hooks for hanging bracelets, purses and more. Shelf actually comes in your choice of black or white. Top shelf holds makeup and other items you want to keep handy. This organizer holds earrings on three sides of the shelf. While the wavy curves help to keep your necklaces from tangling when hung, there are also two large hooks perfect for hanging bracelets, belts, scarves or purses. This product is great for those people who don’t have massive amounts of jewelry, but still want to keep their jewelry organized. The large hooks make it possible to hang other accessories as well such as belts, scarves and purses, and organize many other accessories all in one place. Holds hats, purse and scarves. Comes in black, pink, purple or silver. You can select one of two sizes either 10” X 71/8” X 6 3/4” or 17 1/8” X 7 1/8” X 6 3/4”. Top of shelf holds containers of barrettes, your curling iron or other needed items. 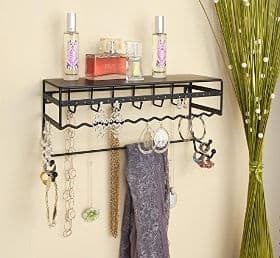 This is a nice shelved jewelry organizer which is perfect for a teens room, or someone who doesn’t have a ton of jewelry, but still want to be organized. You can hang earrings from the top to groups of wires on the side of the shelves while the wavy thick wires are perfect for necklaces. There are also two large hooks on each side to hang bracelets, long necklaces or even belts and scarves. The top shelf is perfect for keeping those hair accessories or other objects you want close at hand. Due to its design, this jewelry shelf is actually quite versatile. Keeps dangling necklaces from tangling. If you are looking for a better way to organize your jewelry, different accessories and, in some of the cases, even a few of your cosmetics or other personal care products, one of the above wall mounted jewelry organizers may just fit the bill.